His vocal onslaught, blues shouting, and percussive keyboard attack will draw comparisons to Little Richard's vocal intensity. His style is rocking, wisecracking, piano pounding, double entendre shouting and soulful ballads and strolls. H-BOMB FERGUSON: "I'M H-BOMB FERGUSON, THE MOTHER'S SON, AND AFTER ME THERE DAMN SURE AIN'T GONNA BE NONE!!" How to define the inimitable persona of H-BOMB FERGUSON, world class singer-pianist-songwriter? Someone said "If you could combine the vocal style of blues shouter Big Joe Turner, the unbridled showmanship of Little Richard and the head gear of a well-aged Rick James, the end result would be something like H-Bomb Ferguson." H-Bomb is the last performing of the original U.S. Blues Shouters. He began his career recording for labels such as Savoy, Derby, Atlas, Prestige, Specialty and King. With Savoy he recorded his hit gold record, "Good Lovin'". He then retired in the 70's. One day he got an idea to perform in wigs and began a comeback. It included bringing the house down on the Chicago Blues Festival in '92. Things have looked up ever since. H-Bomb was born in Charleston S.C. on the 9th of May during the Depression. Bobby was the second last of 12 children born to Irene and Reverend Alonzo Ferguson. His father was a flamboyant man, a sharp dresser, a lover of the ladies and a harsh disciplinarian...A family secret was the strong Cherokee roots, and it seemed to make Alonzo crazy that his features betrayed him. (H-Bomb's paternal grandfather was a fullblood Cherokee.) At 6 Bobby began playing piano in his father's store front Baptist church. Deciding the boy had talent,they scraped 25 cents for piano lessons. This hour was shared with several others under the guidance of Miss Curry. His fiery father overheard him hit a couple blues chords and scowled "That's the devil's music! You keep doing that God's gonna strike you down." H-Bomb's been creating his own honkytonk shag blues from then on, interrupted only by a stint in Europe in the Merchant Marines at the tail end of WWII. Cat Anderson discovered Ferguson at age 17 in a nightclub in Charleston and introduced him to Joe Liggins and the Honeydrippers. Upon hearing his voice they hired him to tour. Young Bobby snuck out the bedroom window in the middle of the night...When they reached New York city, Ferguson went on his own, meeting Nipsy Russell (emcee at The Baby Grand Club in Harlem), who gave him his start. He was known as the Cobra Kid while singing at the Baby Grand. (Sax solos got Cobra Kid gyrating at the mike with a certain snakelike fluidity.) He soon began recording, in 1950 with "Jumpin' and Shoutin'" on Derby. Hits with the Atlas label and Charlie Singleton's orchestra-("I Love My Baby") and "Rock, H-Bomb Rock" helped put Atlas on the map. "My Love" was a hit on Prestige. Everyone asks: "How did you come to the name "H-Bomb"? Straight out of H-Bomb: "Band leader and drummer Jack "the Bear" Parker" backed me on the Prestige hit and on some with Savoy Records. He became my manager. It was his idea, after the hydrogen bomb. He said my voice could shake the room. He brought me to sign on with Lee Magid of Savoy Records. Magid insisted on the H-Bomb name. I didn't like it; didn't want it. 'But that's not even human!' I said. He said I had to try it for 2 months. At first I disliked it, but the fans took to it and now I'm glad I stuck by it." "Good Lovin'" achieved a gold record in 1952 on Savoy. About his early recordings, "H" says: "They were going for a big band sound. I always loved the sax. Bass, piano, and four horns were used. And I played with some of the best! Guitar played a minor part. I wasn't playing piano in most of those recordings. At the time, they said my voice came out much better if I stood at the mike and didn't play the piano..." (save for Derby and Prestige recordings). H-Bomb made the circuit of regional clubs, singing and telling jokes in vaudeville tradition. He reminisces:"I would pick up extra money by volunteering to emcee shows. I sang with house bands or backed myself on solo piano." He accompanied himself on piano because "they were playing more jazz and I wanted blues, man!" "Nanny Miss Fanny" was a hit under the Sunset label. A frequent artist-emcee at the Savoy Ballroom, H was backed up by the Lucky Millander Big Band, and Andy Kirk's orchestra, with whom he recorded "Hole in the Wall Tonight" on Decca. H worked with Ruth Brown and Clarence Gatemouth Brown (Howard Theatre, Washington D.C.) Willis "Gatortail" Jackson and Bullmoose Jackson, and did comedy with Redd Foxx, one of his all time favorites. On tours, H would do stand-up comedy and bring up the performer, and get a kick out of being presented later to the audience to perform, when he delighted surprised audiences with his own songs and wild antics on the piano, such as getting the notes out with his feet. After nine years in NYC, he did the Weinberg Tour in the South under the venue "The Battle of the Blues" with B.B.King ,Tiny Bradshaw and H-Bomb each taking turns at the mike with Bradshaw's band. Due to some jams H-Bomb got the young B.B. out of, they became friends. Other tours H made included fellow blues shouter Big Joe Turner, Moms Mabley, Jimmy Rix and the Ravens and Billy Ward and The Dominoes. H first came to Cincinnati circa 1957 with Tab Smith, saxman who wrote "My Mother's Eyes". The Cotton Club (Cincinnati) booked them together. Headliners of that heyday of blues in Cincinnati: Billie Holliday, Duke Ellington, Count Basie, and Lena Horn. H-Bomb travelled back and forth from the Big Apple. He jammed with Chuck Berry at The Wine Bar on Gilbert and Melish, as well as The Nineteenth Hole on Reading and Rockdale. Frequent bookings came from The Sportsmen's Club and The Alibi in Newport and The Rendezvous in Dayton. Charles Brown, Jimmy Reed and Amos Wilburn played these regularly, and Wynonie Harris appeared at times. In New York H-Bomb often played the Apollo Theatre. He had liaisons with several glamorous women of the '50's silver screen. Friends like Sammy Davis Jr. liked his warmth and wit. One chum H particularly recalls is the legendary dancer, singer-comedian Caldonia, to whom he dedicates one of his audience favorites. Tiring of the crush of New York (he penned "Big City Blues" about it), H-Bomb moved to Cincinnati. Drawn there partly due to a contract with King Records, H had high hopes of extending stardom through them. This never gained momentum, perhaps of King's focus on the rising popularity of James Brown. However, Ferguson quickly became a regional favorite. He formed his own band, "H-Bomb Ferguson and His Mad Lads". Spatz and the Dude Ranch in Hamilton Ohio, the Club Miami in Fairfield loved the Bomb. H was accompanied by the late Big Ed Thompson on guitar, a closeknit association lasting 25 years of shows and recording. They were a hilarious team for those fans close enough to the stage to hear their comradarie, and their repertoire was endless. Cited in Paul Oliver's history book, The Story of the Blues, H-Bomb is one of the pioneers of Rhythm & Blues. In the early 60's H travelled widely, working with Hank Ballard and the Midnighters, Big Maybelle, The Clovers, Freddy King, Big Mama Thornton and Varetta Dillard. H met T-Bone Walker in Texas and relished spending time with him when their paths crossed. H-Bomb's style was influenced by him, as well as by Fats Domino, Ray Charles and Roy Brown. H-Bomb accepted Chuck Berry's invitation to Chuck's 60th birthday party at the Fox Theatre St. Louis. Outside the theatre, fans insisted he was Chuck Berry (some resemblance) and wouldn't let him pass until he signed autographs in Berry's name! After a short retirement in the '70's, H-Bomb found he could not quit the music business, and came out in his now renowned wigs. A new persona with each set! Among his international stellar performances are: Rhythm-Riot Festival, in Rye, East Sussex Great Britain November 2001, Blues Estafette Holland in 1988 and 1991, The British R & B Festival Colne England 1994, Lugano Switzerland Blues to Bop Festival in 1993 and 1994. Though nearly 2 decades had passed without new recordings H-Bomb never quit writing music. In 1986 he received the W. C. Handy Award for "Shake and Bake," released on an independent label called Radiation Records. In 1987 he formed The Bluesmen and won a 1989 W.C. Handy Award from the National Blues Foundation for the single "Medicine Man." (Finch) In '89 he recorded "Bad Times Blues" album cassette. With his ace band, "The Medicine Men" H-Bomb gave a scathing performance at 1992 Chicago Blues Festival. The crowd wouldn't let him leave the stage: he was given an unheard of 2 encores on a show that was the hit of the festival. 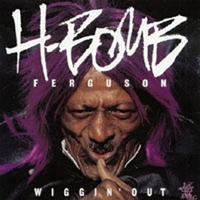 As a result, he recorded with the Chicago based national label, Earwig Music, and the C.D., "H-Bomb Ferguson: Wiggin' Out" has been acclaimed by critics and fans internationally. He has been enjoyed immensely at U.S. blues music festivals such as the 1994 Mississippi Valley Blues Fest, Davenport Iowa and countless regional fests. Always known to lead a band of the highest caliber musicians, his swingy jump blues continues to invite dancing and delight generations. H's favorite self introduction sums it up: "I'M H-BOMB FERGUSON, THE MOTHER'S SON, AND AFTER ME THERE DAMN SURE AIN'T GONNA BE NONE!!" Classic album from the late Cincinnati Icon. Great swinging jump-blues from a Cincinnati icon who sadly recently passed away. Not a weak cut on the album! This man really knows how to do it!Its a party everytime you listen to his great music!I recommend this one for sure!They just don't make them like this anymore! Without a doubt, I have had more enjoyed this CD more than any other in recent history. H-Bomb puts his heart and soul into Leavin you Tomorrow and swings with Midnight Rambin Tonight. This CD is a must have for anyone who understands the Blues.